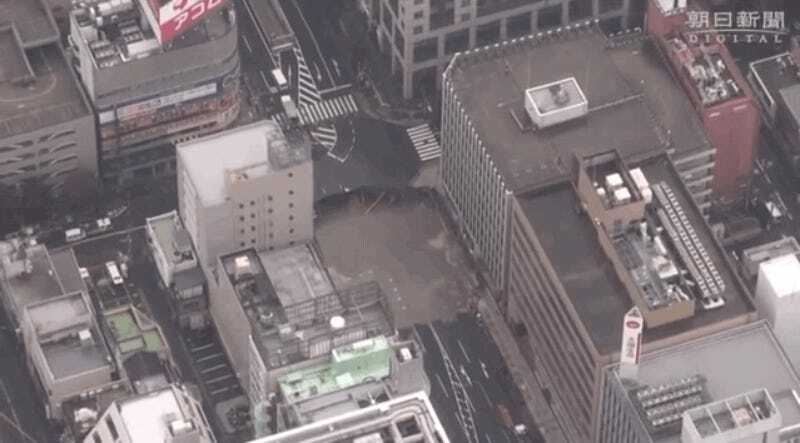 Residents of the southern Japanese city of Fukuoka had a rather rude awakening this morning when a gigantic sinkhole formed near the JK Hakata train station. Local officials are now desperately working to prevent the collapse of nearby buildings. The road outside the train station began to collapse in two sections around 5:15am local time, and they gradually expanded and collapsed into one gigantic hole (check out the dramatic video below). The hole now measures nearly 100 feet across and 50 feet deep. Flowing water from a drain filled the opening like a bathroom sink, raising concerns that it could expand further and topple buildings nearby. Evacuations were ordered, and electricity was cut off for fear of igniting a gas leak (some 800 households are now without power). No injuries have been reported. City officials admitted that work to bore a tunnel for a subway extension was the cause of the cave-in. Construction workers were digging about 80 feet below the surface when they noticed groundwater starting to flow into the tunnel. Realizing that something was askew, the workers monitored the tunnel while regulating traffic on the surface. Over the course of the next few hours the hole got increasingly larger. By the early afternoon, the city government decided to fill the hole as a stopgap measure to prevent buildings along the road from collapsing. A drilling survey found that groundwater flowed into areas deeper than 10 to 16 feet below the surface. Workers tried to discharge the water with pumps, but were unable to prevent the cave-in.